(From left) Prof. Dr. Kuik Cheng-Chwee, Associate Professor of the Institute of Malaysian and International Studies (IKMAS), Universiti Kebangsaan Malaysia; Dr. Cecilia Ruthstrom-Ruin, Deputy Director-General, Head of Department for Asia and Oceania, Ministry of Foreign Affairs, Sweden; Dato’ Dr. Ooi Kee Beng, Executive Director of Penang Institute; Tan Sri Dr. Munir Majid, Chairman of CIMB ASEAN Research Institute (CARI) and President of the ASEAN Business Club; Tobias Glitterstam, Senior Vice President and Head of Asia and Oceania of Business Sweden; Ng Lip Yong, Honorary Advisor of Malaysia-China Chamber of Commerce; and H.E. Ambassador Dag Juhlin-Dannfelt, Ambassador of Sweden in Malaysia, at the ASEAN Roundtable Series entitled “How Does ASEAN Navigate the New Trade [Dis]order?”. The roundtable discussion was organised by CARI in partnership with the Embassy of Sweden in Malaysia on 1 April 2019. 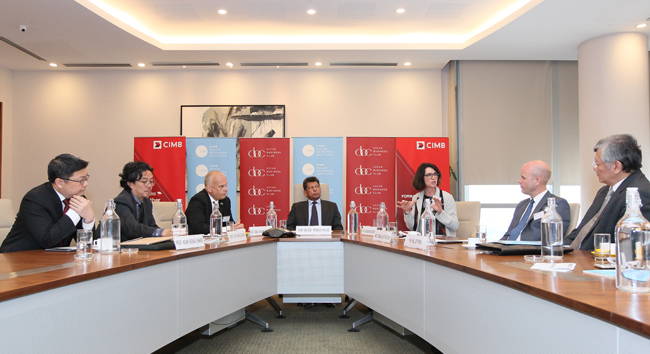 Kuala Lumpur, 1 April 2019 – Experts speaking at the ASEAN Roundtable Series on the topic of “How does ASEAN navigate the new trade [dis]order?” organised by CIMB ASEAN Research Institute (CARI) traced the roots of hedging behaviour and identified lack of cohesiveness as some of the weaknesses that ASEAN has to overcome while navigating the new trade uncertainties. Professor Kuik Cheng Chwee, Associate Professor of the Institute of Malaysian and International Studies (IKMAS) at the Universiti Kebangsaan Malaysia (UKM) said the growing US-China uncertainty has been the primary external factor shaping Southeast Asian security and economic environment in the Trump-Xi era, but the issue is not just about trade. It is also about the risks of power rivalries, the dangers of ASEAN marginalisation, and the politics of infrastructure development partnerships. “All ASEAN countries navigate by deepening their hedging behaviour. The structural uncertainties are presenting both challenges and opportunities to all ASEAN countries, prompting the medium- and small-sized regional states to deepen their hedging behaviour, as evidenced in their ambiguous and contradictory approaches vis-a-vis the US’ FONOPs (freedom of navigation operations) in the South China Sea, China’s Belt and Road Initiative (BRI), and the Quad (the US, Japan, India and Australia) powers’ “Indo-Pacific” strategies,” said Professor Kuik. Echoing similar views, Honorary Advisor of the Malaysia-China Chamber of Commerce Ng Lip Yong said that it is likely that ASEAN member states will prioritise national interests above ASEAN’s regional interest amidst the current trade tension between the US and China. “Although ASEAN is often considered an economic bloc, it is unlikely that ASEAN will respond to the new trade scenario in a cohesive manner. As witnessed in the case of the EU-ASEAN free-trade agreement (FTA) negotiations, it has now resulted in bilateral rather than multilateral agreements. Despite all the efforts, currently only Singapore and Vietnam have signed the FTA with the EU,” said Ng who was formerly the Deputy International Trade and Industry Minister of Malaysia. Dato’ Dr Ooi Kee Beng, Executive Director of Penang Institute pointed out that ASEAN as a region is bounded from without rather than from within; and is not held together by common imaginings of a historical or cultural past. The historical expediencies that created the countries in Southeast Asia are vital to the understanding of how their foreign affairs policies have been developing. In relation to the issue of China, he said China’s rise in recent decades is causing worry among its small neighbours and how ASEAN should handle the rising giant is a major strategic dilemma for its members. “While ASEAN countries tend to think of China as an unstoppable rising power, it is crucial for ASEAN to understand the nature of China’s rise the way they would do with a peer country. How China rebuilt itself, how this informs its immediate future and the way it views the world provide a perspective worth contemplating for strategists,” said Dato’ Dr Ooi. The roundtable discussion was organised by CARI in collaboration with the Swedish Embassy in Malaysia. H.E. Ambassador Dag Juhlin-Dannfelt, Ambassador of Sweden in Malaysia in his opening remarks said Sweden is a staunch believer in a rules-based international order for trade and Sweden is greatly interested in the development of ASEAN integration at a time of increasing challenges to WTO-rules based international trade order. In conclusion, Tan Sri Munir Majid, Chairman of CARI concurred with the observations that ASEAN member states’ hedging behaviour and the lack of oneness may cost ASEAN’s centrality in the new trade order. “ASEAN’s political determination will either make or break the integration aspiration. It will either set ASEAN apart from the protectionist trade order or derail it from its integration trajectory. ASEAN must forge deep partnership within the bloc to ensure its centrality among the competing forces,” said Tan Sri Munir. He welcomed the collaboration with the Swedish embassy in Malaysia for this ASEAN Roundtable Series as the Swedish Embassy’s presence, knowledge and concerns are among the strongest in the region relative to other European counterparts.